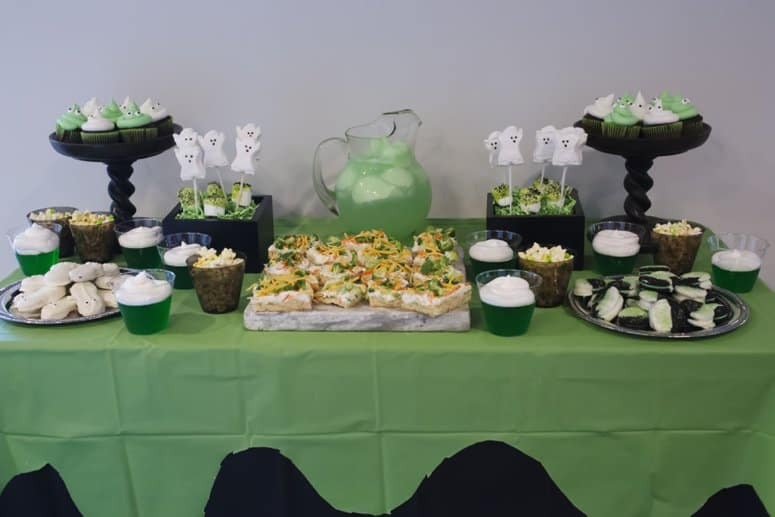 With Halloween just around the corner, it’s the perfect time to throw a kid-friendly Ghostbusters party! Sharing the fun of Ghostbusters with a new generation is so much fun. 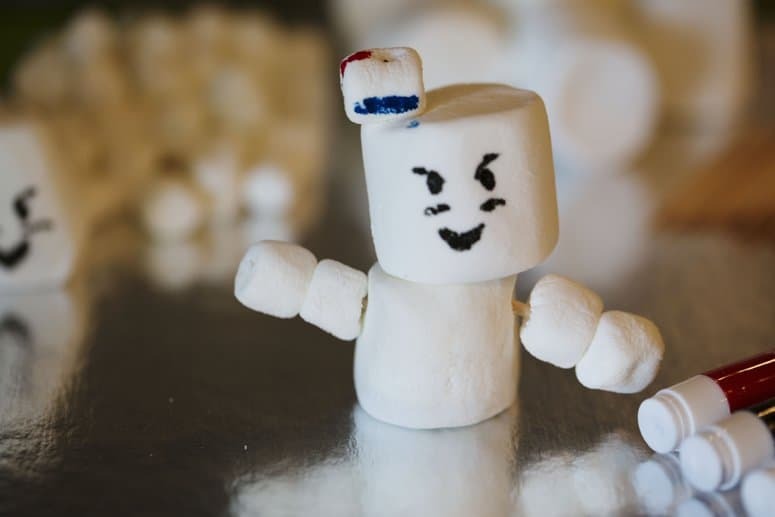 What kid doesn’t love Slimer and the Stay Puft Marshmallow Man? 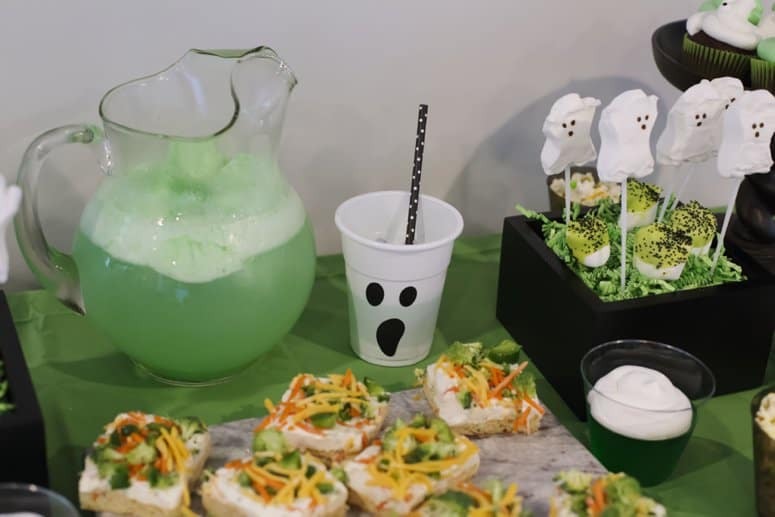 In this post you’ll find ideas for kid-friendly party decor, food, and 7 fun activities for your Ghostbusters party. Spread crescent rolls on a large baking sheet or jelly roll pan. Pinch the seams shut, to form one solid crust. Bake crust for 12 minutes, or until golden brown. Using a mixer combine the softened cream cheese, sour cream, and ranch seasoning. Refrigerate for at least one hour (I prefer overnight) before slicing and serving. 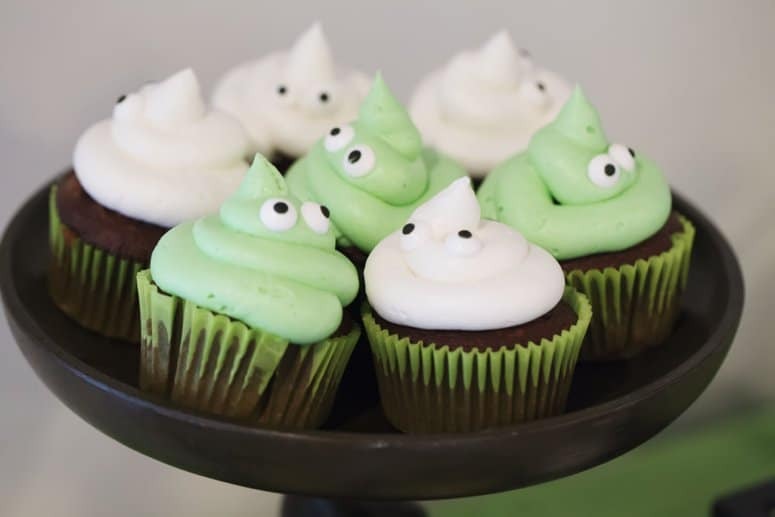 To decorate for a kid-friendly Ghostbusters party, concentrate on lots of cute little ghosts, and lime green accents to represent Slimer. 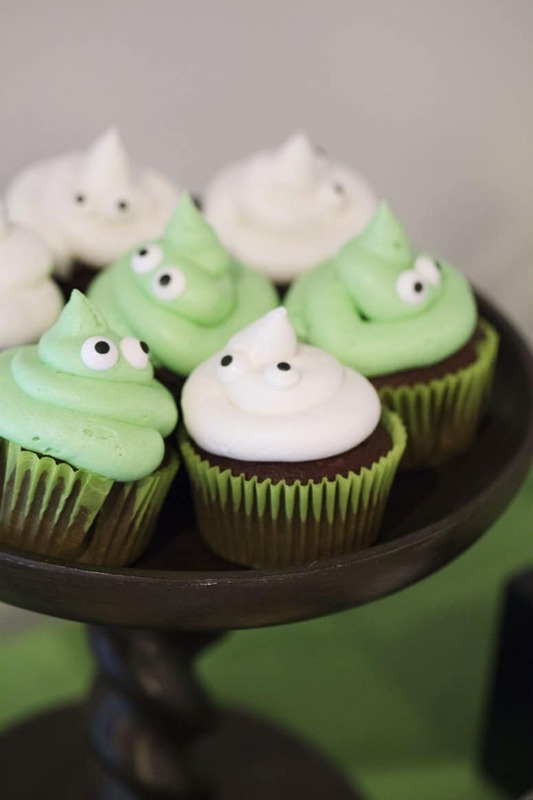 Create a dripping ectoplasma table-cloth by simply cutting a plastic, lime green table-cloth as the slime. When it comes to decor, I’m a fan of letting the food be the decor. 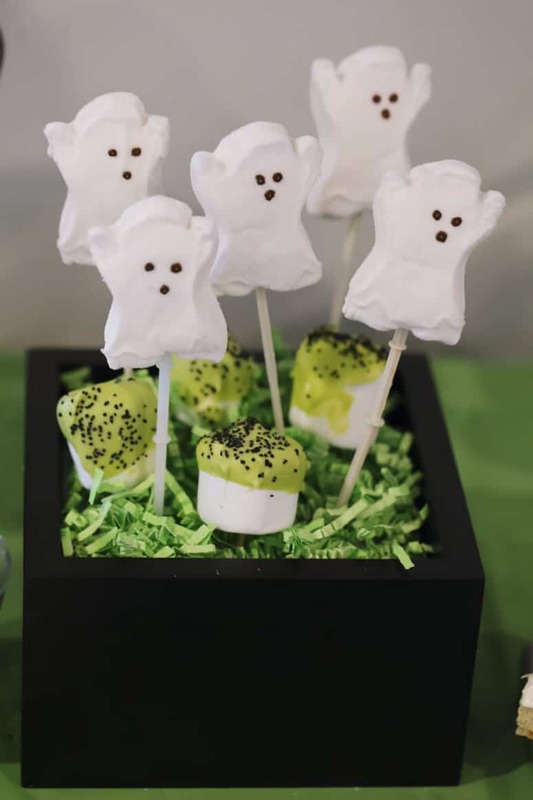 Ghost marshmallows, cupcakes, and cookies continue the party theme while also tasting delicious! 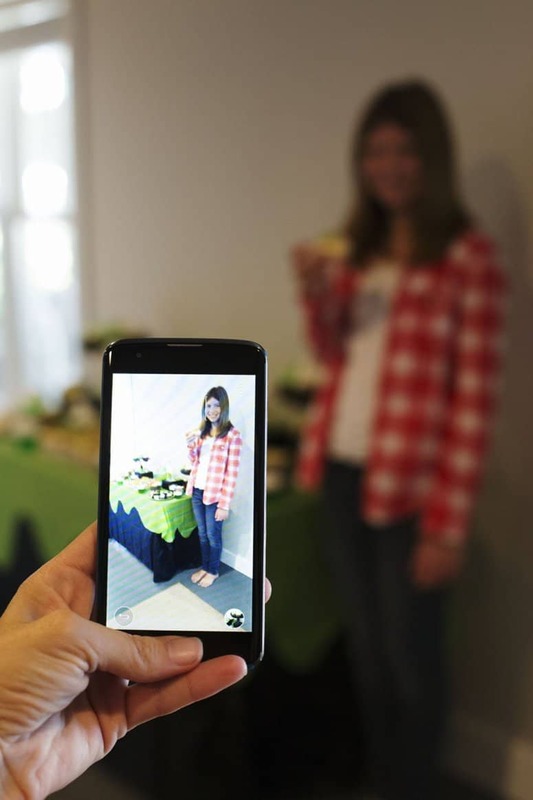 A party without fun activities is no party at all, according to my children, so I used my Walmart Family Mobile PLUS Plan to inspire fun activities for our party. 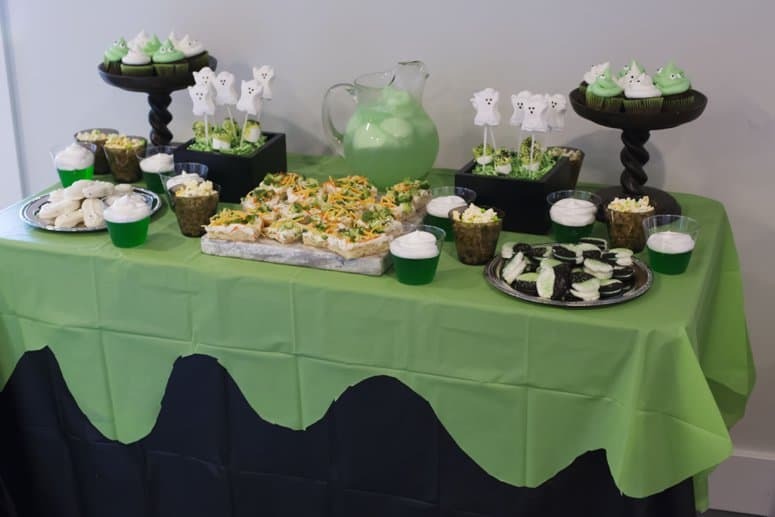 The extra value of this plan’s data which includes unlimited data, with 10GB of 4G LTE, is a big deal for planning parties between searching Pinterest for ideas, searching for recipes, and shopping online for party decor. The Walmart Family Mobile PLUS Plan includes more than just data, it also includes unlimited talk, and text, plus a free movie on VUDU every month ($7 value) per line for $49.88! After our big day of Ghostbusters partying, I know I’ll be ready to curl up in my bed with a good chic flick using my free VUDU movie this month. 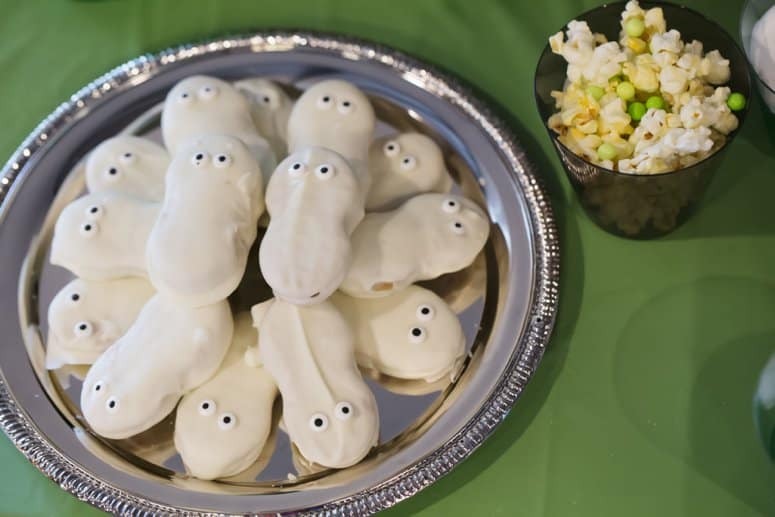 This was hands down the favorite activity at our party. What kid wouldn’t want to fight floating ghosts with proton pack silly string?!? 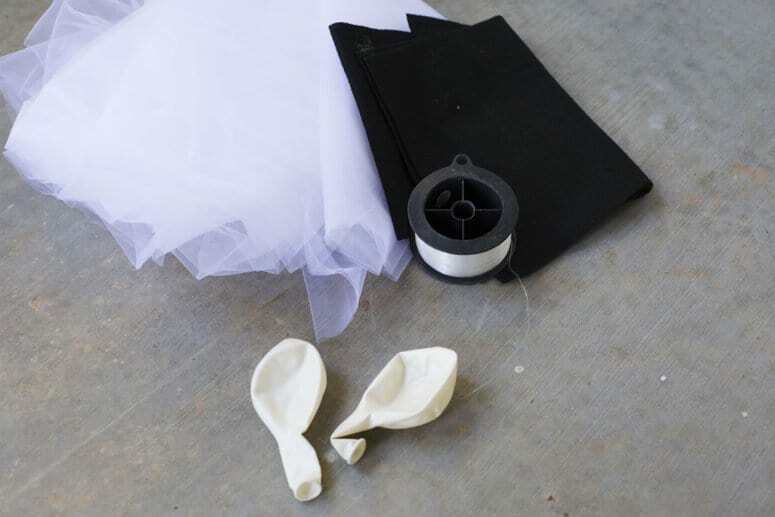 Gather fishing wire, clear packing tape, double-sided tape, white balloons, black felt, and several yards of tulle (I used 7 yards for 3 ghosts). 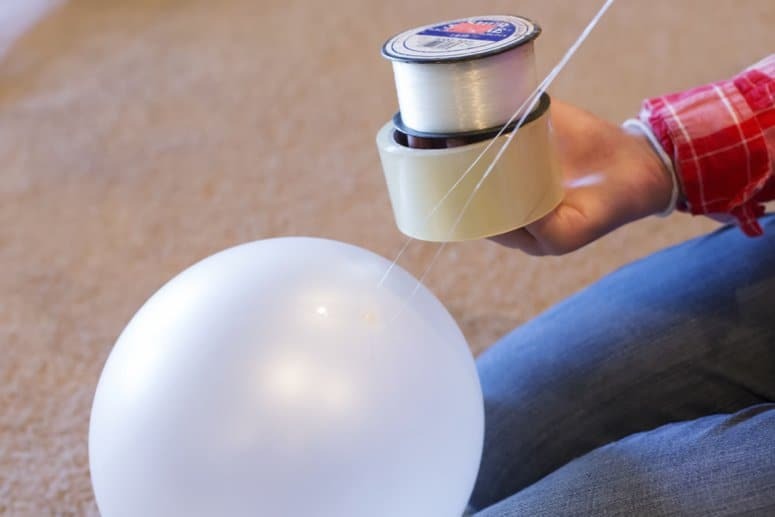 Blow up a balloon, and tape a length of fishing wire to the top of the balloon with clear packing tape. 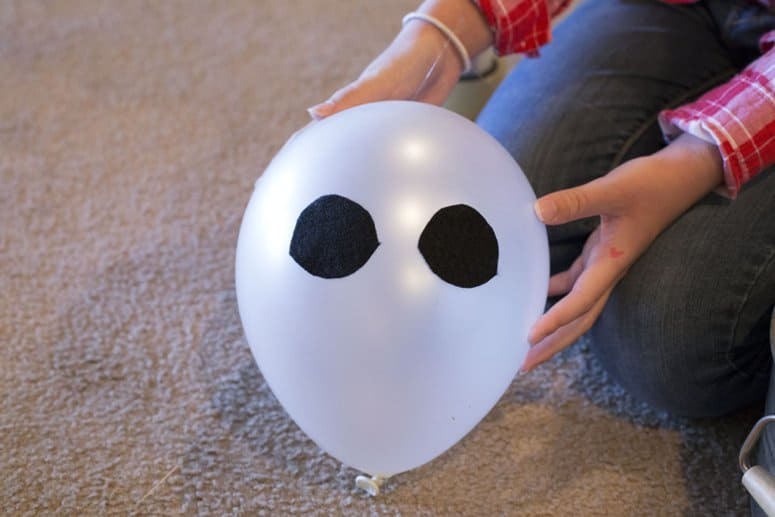 Cut out circles for eyes from black felt, and tape them to the balloon using double-sided tape. Leave the tulle fabric folded in half, as it was on the bolt of fabric. 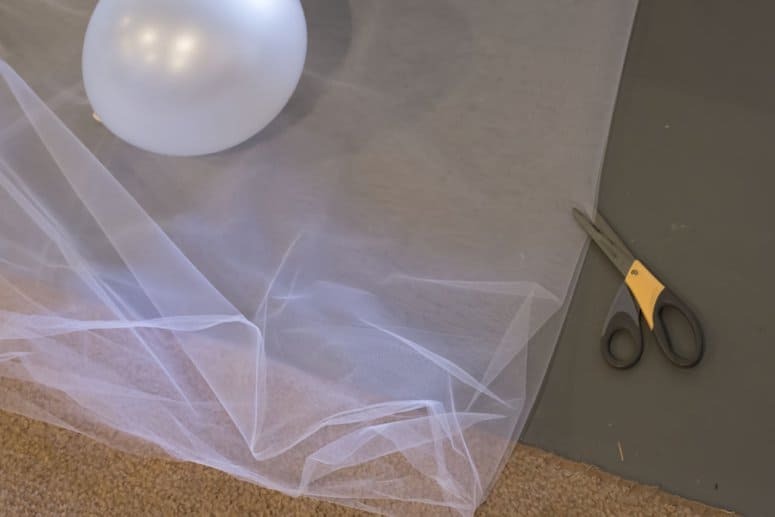 Lay the tulle out and decide on a length for your ghost, then fold the fabric in half so the length is doubled. Cut a small slit in the top middle of the fold. 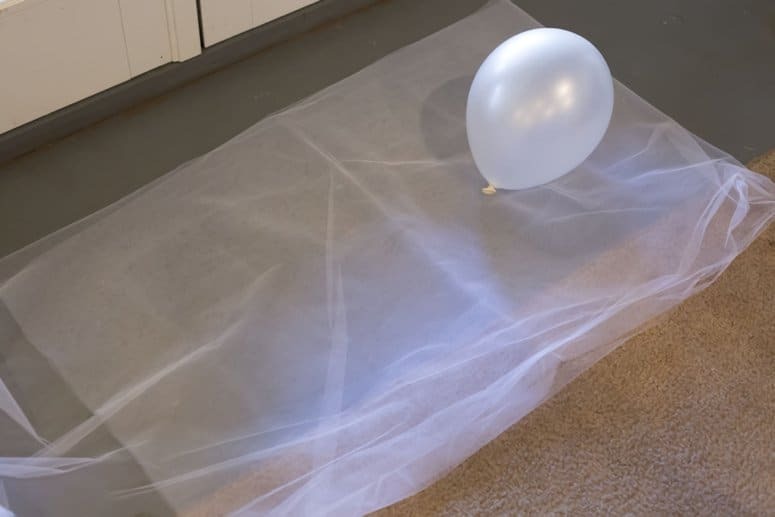 Place the balloon between the two long layers of tulle, and thread the fishing wire through the slit. 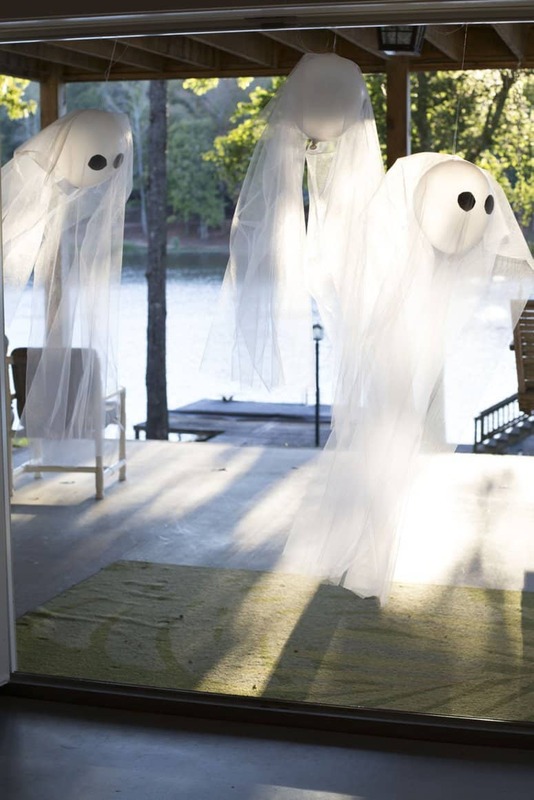 Hang the ghosts using packing tape and the fishing wire. 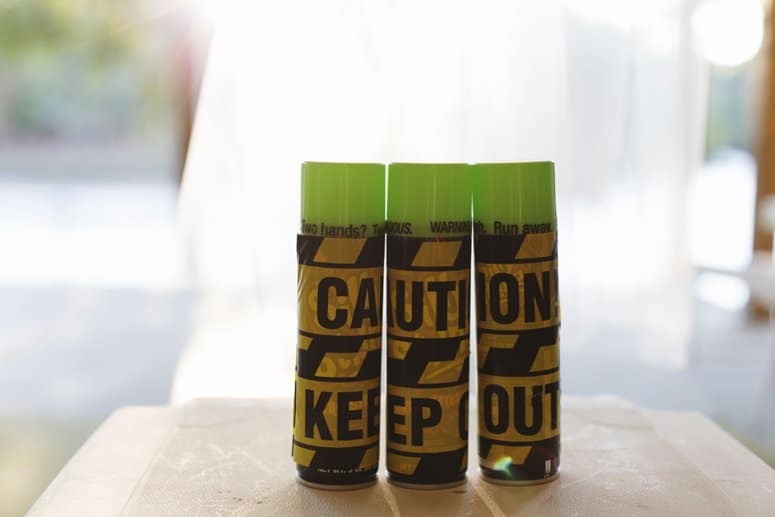 Next, make proton packs by using double-sided tape cover cans of silly string with caution tape. 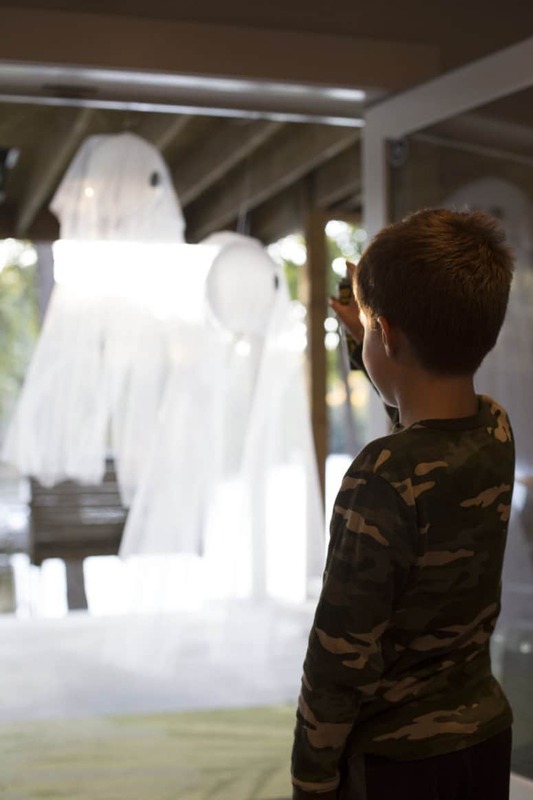 Line the kids up and let them battle those ghosts! 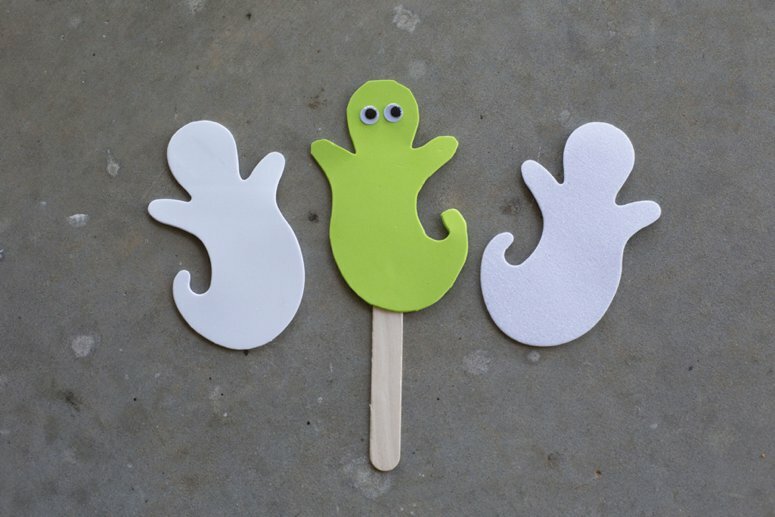 Place crafting supplies in a tray so children can use their imagination to create Slimer and ghost crafts. 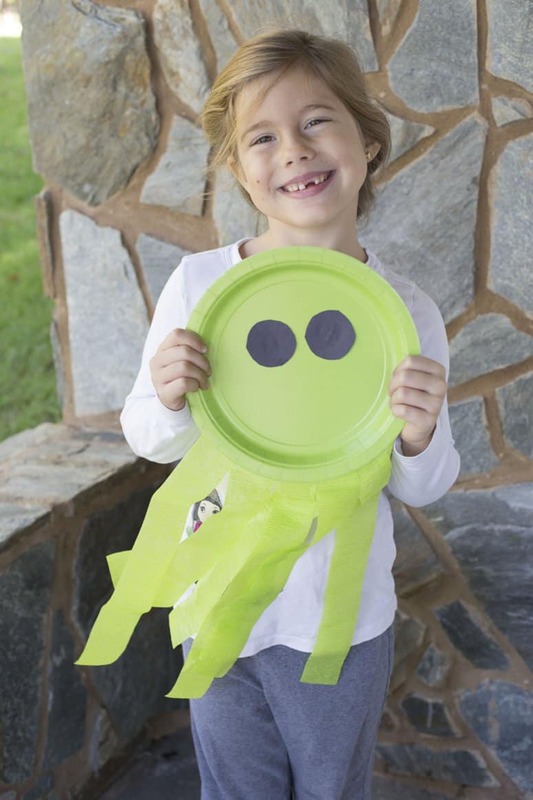 Some craft supply ideas include paper plates, streamers, foam, and construction paper in shade of green and white, plus googly eyes, glitter, glue, and double-sided tape. 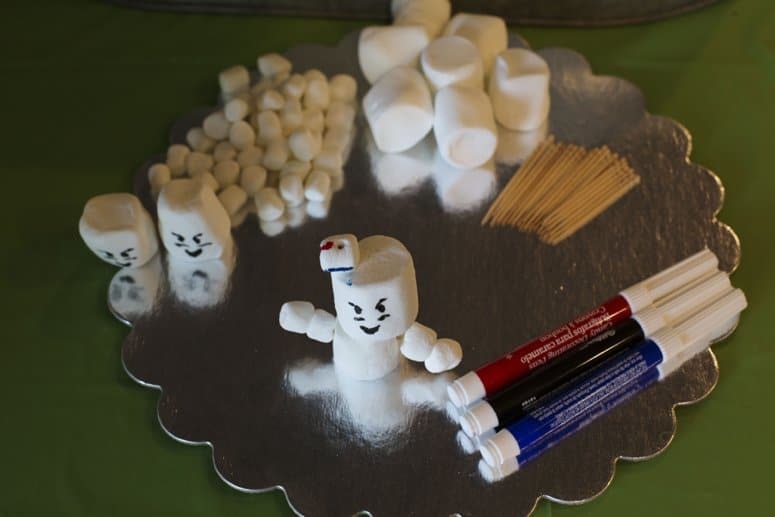 Provide several sizes of marshmallows, toothpicks and food-safe edible markers for creating Stay Puft marshmallow men. 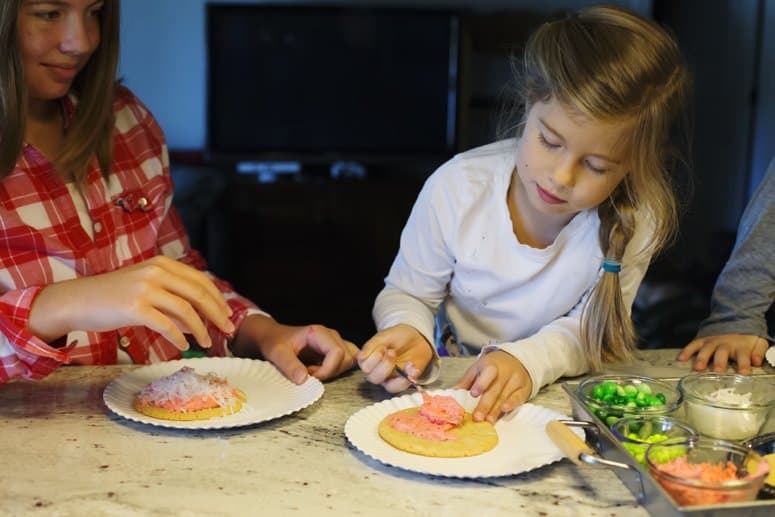 Bake sugar cookies as pizza crusts. Tint your favorite vanilla frosting red for pizza sauce. Then use shredded coconut for cheese and small candies for pizza toppings. 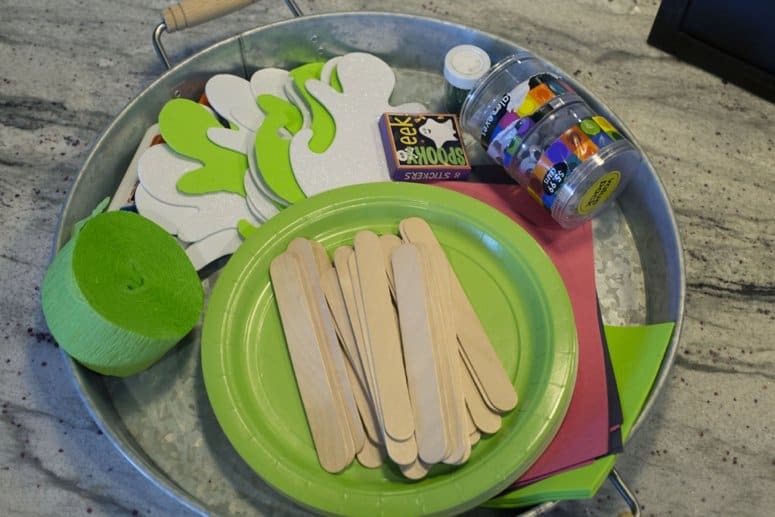 You can pre-make slime for the children to play with, or allow the kids to make their own slime at the party. 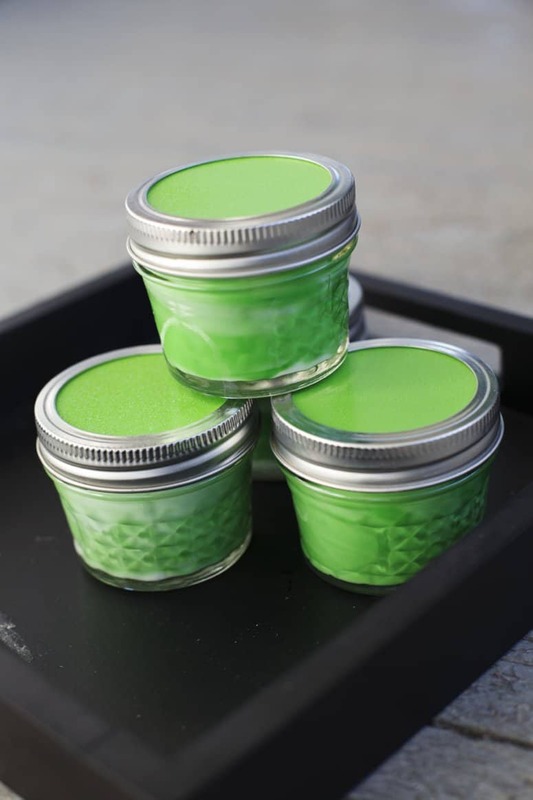 Provide small mason jars, so children can take the Slimer Slime home with them. 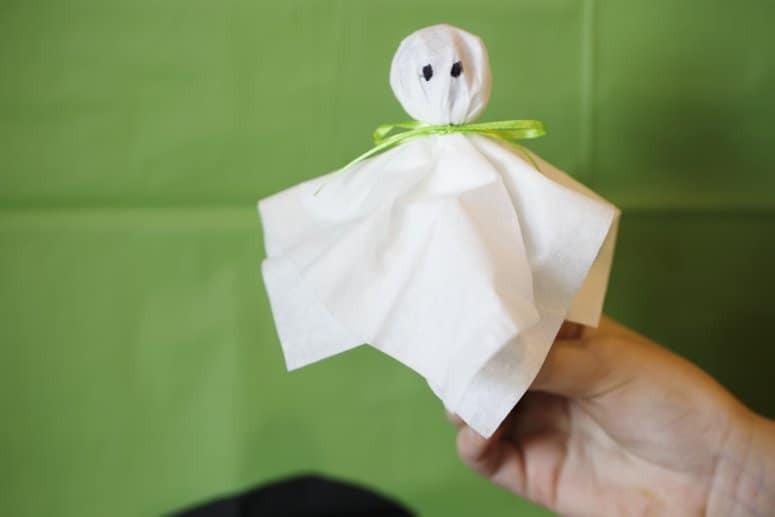 Use tissues, ribbon, a black marker, and lollipops to make adorable ghosts! Between all that yummy food and fun activities, your party guests are bound to be full and tired! 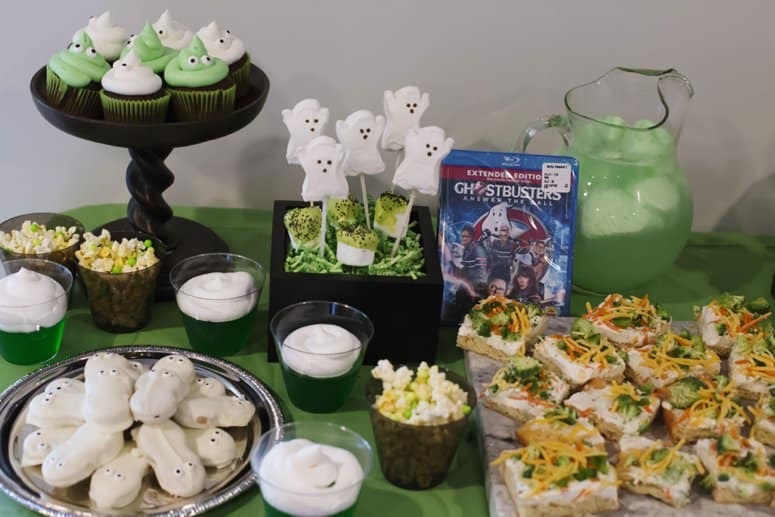 Why not end the party watching the new Ghostbusters movie (now available on Blu-ray, DVD and 4K Ultra HD) with older party guests after the little ones head to bed? You’ll find the Ghostbusters Extended Edition on Blu-ray at Walmart with over 15 extra minutes not seen in movie theaters plus over 3 hours of hilarious extras. 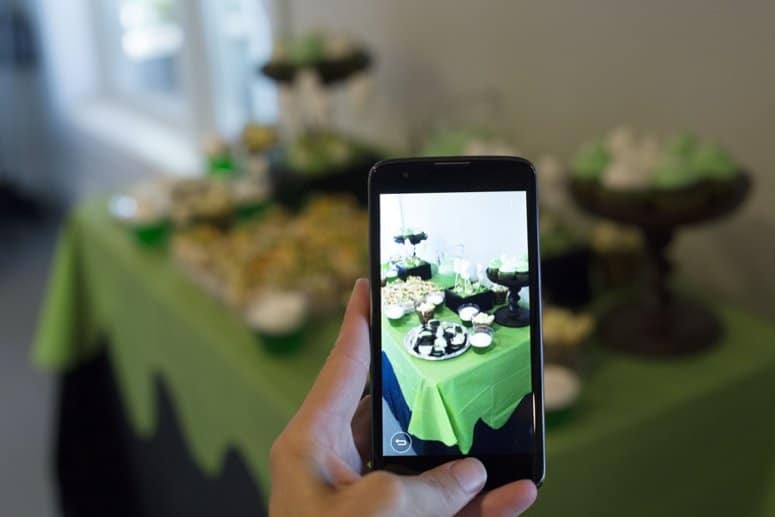 During your Ghostbusters party be sure to document all the party decor, food, and fun using your Walmart Family Mobile phone, while also sharing the play-by-play of fun on social media with that unlimited data! *My LG K7 phone is a great deal too, only $49.88 (Rollback from $89.88). Plus, the Nano Starter Kit is also on rollback to $19.88 from $25. Start service on ANY plan today for $19.88! Any customer who activates a new line on any rate plan from 10/1-10/31, will get a free download of the Ghostbusters Virtual Reality Experience via a code. During the VR experience you’ll get to fire a proton pack and look at ghosts straight in the eye! 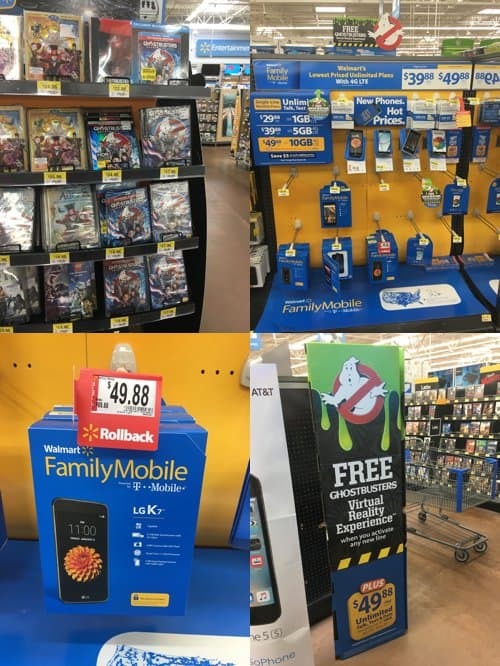 While you are in Walmart activating your new Walmart Family Mobile PLUS plan, look for a Walmart Family Mobile in store event (find an event near you here) which will help you learn how to activate a new line, get help activating your new phone, plus get brochures and a 3D Plastic Hologram and learn how to experience the free Ghostbusters Virtual Reality Experience. Simply buy a Walmart Family Mobile product, get the code, visit GhostbustersVR.com, register and redeem the code, and download the app to play! 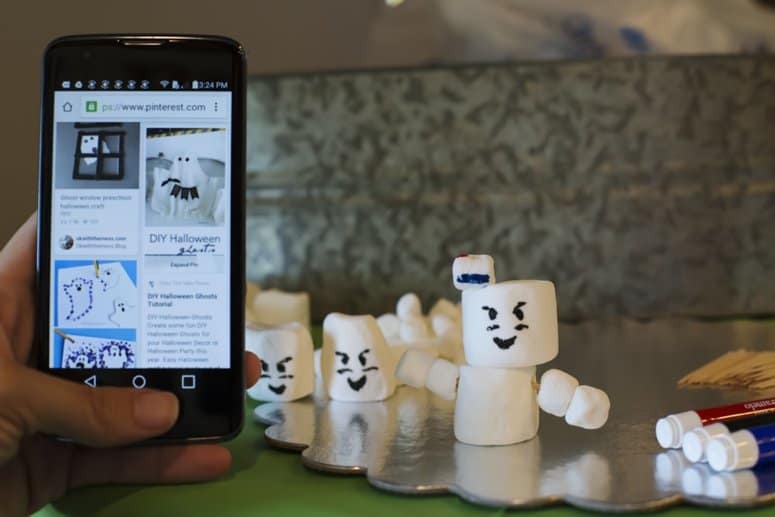 Check out other great Ghostbusters themed ideas here. *All prices for phones and plans included in this post are accurate as of the date of posting; however, these prices are subject to change. Please refer to http://cbi.as/5jo2h or your local Walmart for current pricing.